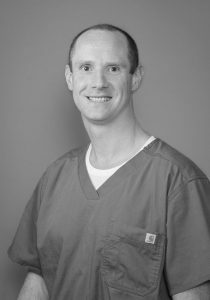 Dr. David Hummel is board certified by the American College of Veterinary Surgeons. He received a BS in Biology from Virginia Tech, and a DVM degree from the Virginia-Maryland Regional College of Veterinary Medicine. After graduating from veterinary school, Dr. Hummel completed a rotating internship at Oradell Animal Hospital in New Jersey, as well as a surgical residency at the University of Illinois. Following his residency, Dr. Hummel returned to the East Coast, where he worked as a staff surgeon at the Veterinary Emergency and Specialty Center in Richmond, Virginia before joining Skylos Sports Medicine. Dr. Hummel has a passion for arthroscopy and minimally invasive orthopedic surgery. He has published several peer-reviewed research articles on topics including total hip replacement, management of long bone fractures and cranial cruciate ligament injury and stifle stabilization. Dr. Hummel is a surgical consultant for the Veterinary Information Network, the largest web-based information service for veterinarians worldwide. Dr. Hummel is also active as a mentor for veterinary students at the VA-MD Regional College of Veterinary Medicine. Dr. Hummel thrives on the relationships he forms with his clients and patients and strives to provide the very best care to each patient, and clear communication with every client. Dr. Hummel’s wife Katie is also a veterinarian. They have two children, two dogs, and one cat. When not spending time with his family, Dr. Hummel enjoys fishing, gardening, and woodworking.